Response: Melanoma is the third most common type of skin cancer and the most deadly. Each year in the United States, over 70,000 people are diagnosed with melanoma, and more than 9,000 die from the disease. Melanoma is often caused by overexposure to ultraviolet (UV) rays from the sun or artificial sources like tanning beds. Previous reports have shown a steady increase in melanoma incidence rates over time, specifically among non-Hispanic whites. The purpose of this study was to determine if this trend differs across age groups. 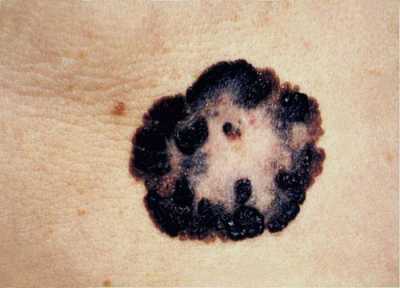 This image depicts the gross appearance of a cutaneous pigmented lesion, which had been diagnosed as superficial spreading malignant melanoma (SSMM). Note the roughened edges of this mole, its heterogeneous, mottled, multicolored appearance, as well as its multi-textural composition, which are all characteristics that should evoke suspicions about its classification. SSMM makes up 60 – 70% of clinical subtypes of melanoma, can appear at any site on the body, displays a radial growth pattern, and histopathologically, is found to reveal a more pagetoid, i.e., melanocytes spreading upward into epidermal layer, and less elastotic cytoarchitecture. Solar elastosis is characterized by a degeneration of the skin’s elastic and collagen fibers, giving it a sagging, wrinkled appearance. Response: We found that among non-Hispanic whites, more than 70% of melanoma cases were diagnosed in adults aged 55 years and older. Melanoma incidence rates increased significantly between January 2005 and December 2014 among non-Hispanic whites of all ages combined. Melanoma incidence rates decreased among non-Hispanic whites aged 15-24, 25-34, and 35-44, but increased among non-Hispanic whites aged 55-64, 65-74, 75-84, and 85+. We observed similar patterns when examining trends among men and women separately. Response: The steady increase in melanoma incidence rates among older adults indicates a need to promote sun safety and avoidance of tanning behaviors throughout adulthood. People of all ages can benefit from protecting their skin. Plan ahead and make sun protection part of your routine. When spending time outdoors, wear protective clothing, apply sunscreen (broad spectrum, SPF 15+) on exposed skin, and seek shade, especially during midday, when the sun is most intense. This combined approach works better than relying on sunscreen alone. Avoid sunbathing and indoor tanning altogether. Simply put, tanning your skin is damaging your skin. The slight decrease in melanoma incidence rates among younger adults is good news and may be related to a decrease in UV exposure among younger age groups. Ongoing efforts to promote use of sun protection and avoidance of tanning are essential in order for this promising trend to continue. Increasing shade at playgrounds, public pools, and other public places. Promoting sun protection in recreation areas, including the use or purchase of hats, sunscreen, and sunglasses. Encouraging employers, childcare centers, schools, and colleges to educate employees and students about sun safety and skin protection. Restricting the availability and use of indoor tanning by minors. Response: These findings highlight the need to promote sun safety among adults of all ages, including older adults. However, there has been a lack of research regarding strategies to reach older age groups with these messages. In addition to ongoing research on how to best promote sun-safe behaviors among younger ages, there is a need for research focused on the unique needs of older adults. Such efforts could target high risk groups, such as people who work outdoors and people who try to tan. Continuing to monitor melanoma incidence rates will also be important, allowing us to track our progress towards national skin cancer prevention goals over time and guide future prevention strategies. Response: For additional sun safety tips and resources, visit www.cdc.gov/cancer/skin. This entry was posted in Author Interviews, Cancer Research, CDC, Melanoma and tagged melanoma by Marie Benz MD FAAD. Bookmark the permalink. Make sure to wear SPF lotion and proper apparel for protection.